As a DJ collective, Meltdown has been around since 1993 when it was set up in the Finnish town Vaasa. Last year saw the Meltdown’s debut as a label with Vesa-Matti Kivioja’s (Ostrobothnia Power Discs, Ljudverket) “Miller Street Sessions”, a five-track EP between acidic floor action and experimental soundscapes. 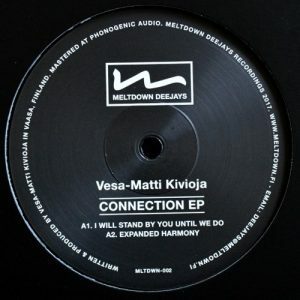 In the second Meltdown release, the opener “I Will Stand By You Until We Do” is an admirable piece by Kivioja, exhibiting techno’s brighter side with warm chords and driving acid house bassline. Still enjoying the heat of sunrays, “Expanded Harmony” is of more propulsive kind and then Kivioja passes the baton to Kollektiv Jurmo, who on their side rely on familiar dubby elements and generic arrangements in “Monomania” and “Doubling”.